Welcome to Minnows & Sardines Class News. We are a reception class. Our Teachers are Miss Lee and Miss Isted. Our Teaching Assistants are Mrs Kimmitt and Mrs Mewburn. 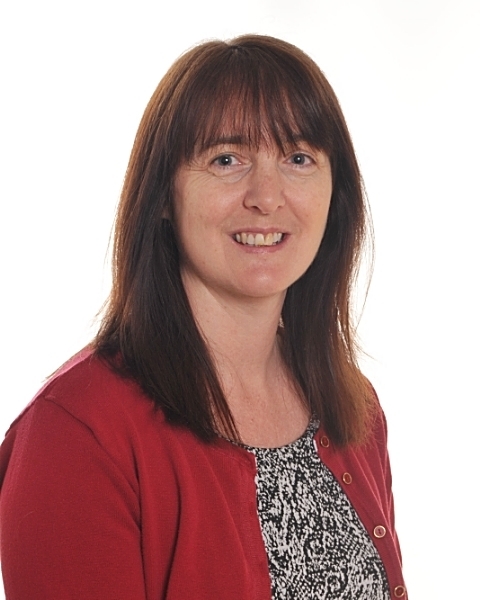 Our Early Years Lead is Miss Isted. The Reception classes have had a busy few weeks! We have read the stories Owl Babies and Monkey Puzzle which led to a discussion about our families and the special people in our lives. We have been sharing ideas and experiences of how our families care and look after us and how this makes us feel. We have also been re-capping and developing our reading and phonic skills, focusing on blending sounds to read cvc words and also reading tricky words by sight. This week we have begun exploring the Christian Festival Easter and have shared our experiences of Easter. We have read the Easter story and explored Christian traditions and celebrations. The children have enjoyed making rabbits, painting eggs and making Easter cards. In maths we have continued our learning about measures and have been ordering objects by size, weight, length and height. We have been using language to compare and talk about different measures. We have also been exploring how to solve subtraction problems by counting back to find the total and using a number line to count back. The children are now beginning to record both addition and subtraction number sentences. Thank you for all of your support this term, we would appreciate if you would spend time with your child exploring your home learning packs (that went home after parents evening) over the holidays to help your child progress with their next steps. We would like to wish you a happy Easter and hope you have a wonderful Easter holiday! The Reception classes have had a wonderful start to Term 4. The children have really enjoyed swimming and have made us proud with their exceptional behaviour in the pool. They have engaged well with the lessons, showing bravery in the water and excellent listening to adult instructions. We learnt to re-tell the familiar story Goldilocks and the Three Bears and sequenced the main events from the story. We then created our own stories and came up with a wonderful range of main characters, settings, problems and happy endings! The children looked amazing in their World Book Day costumes and we enjoyed celebrating the day by exploring a range of books. This week we have read the story The Hungary Caterpillar and created a weekly food diary for the caterpillar. We explored a range of food and discussed which are healthy and which are unhealthy. In maths we have been exploring how to solve addition problems by counting to find the total and using a number line to count on. We have also been continuing and making our own patterns. To celebrate that the children have learnt all the Phase 2 and Phase 3 sounds we would like to invite you to join our Phonics Party. There will be lots of phonics games and activities for you to enjoy with your children. After reading Zog by Julia Donaldson the children decided to build a castle in Minnows role play. We explored rhyme with The Princess and the Peas by Caryl Hart. We have been applying our understanding of number with data handling, learning how to make tallies and pictograms. We kept warm in the cold weather by making vegetable soup for snack time. This week has been all about Chinese New Year. We’ve enjoyed sharing different music, food and traditions. We even made a dragon, decorations and instruments for our own Chinese New Year parade with Pugwash Nursery. Before the end of term we will be learning more about our senses, finishing off our riddles for the poetry competition and enjoying a familiar favourite Going On A Bear Hunt by Michael Rosen. This year we have trialed a new transition music project called Ready 4 School. The children (and staff) have benefited from weekly music sessions with a specialist teacher. The programme comes to an end at the end of this term. The staff and children would like to invite parents to a special celebratory concert on Friday 15th February at 10am. We had a wonderful end to term two with a trip to Little Street in Maidstone. 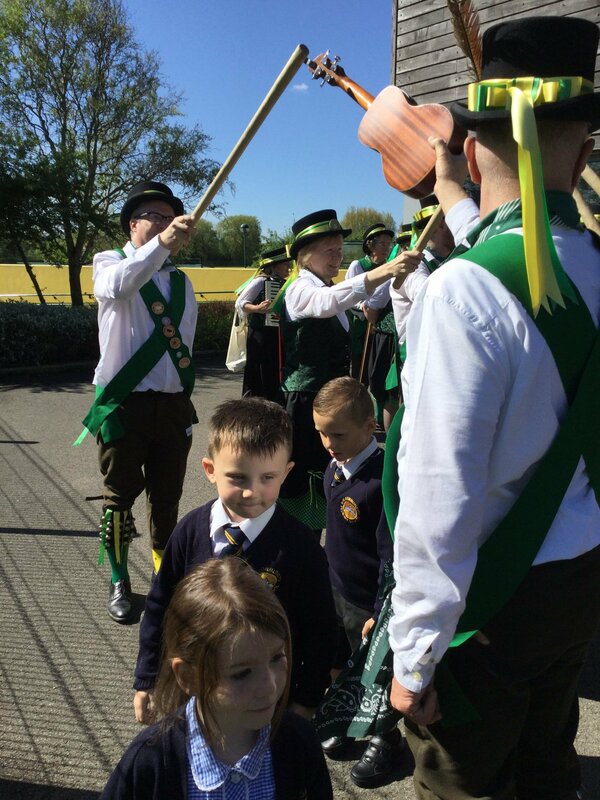 The children thoroughly enjoyed the journey there riding in the big green coach and looking at so the change of countryside into town scenery. Once we arrived the children entered a purpose built mini town where they could let their imaginations go wild. So much fun! So much learning! The children’s behaviour on the trip was exemplary and we cannot wait to take them out again, what a credit to the school they are! Minnows and Sardines have had an exhausting few weeks preparing for our Christmas Performance of 'Shine Star Shine'. We performed to our families on Monday 10th December. The children were amazing! Thank you to all the adults for providing the costumes. 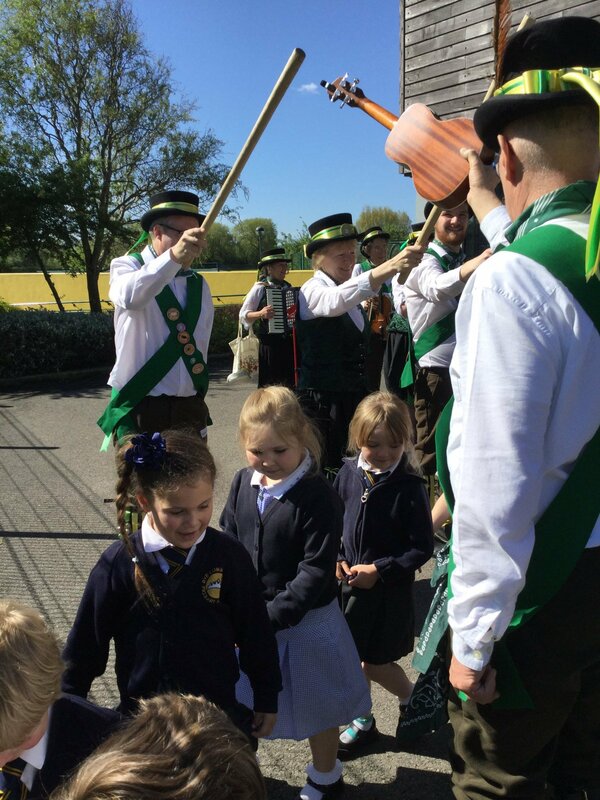 We would welcome any photos from parents to be sent in, as we didn't get time to take any at the shows! This month we have read Stickman and thought about all his different uses. We have used stickman to explore length and measuring. We have also read the Nativity story, and learnt to retell it using Talk 4 Writing actions. The children used the characters to tell the story within their own play. We have also been practising one more and one less. We have been so busy creating Christmas decorations, writing Christmas cards, Christmas lists, using scented Christmas playdough and much more! Thank you again for all of your support, we have sent home learning packs and would appreciate if you would spend time with your child exploring these over the holidays. What a busy start to the new term! We have celebrated Bonfire night, Diwali, Remembrance Day, World Kindness Day and Children in Need! We are learning about People Who Help Us as our topic. We have explored different roles in society, talked about our parents jobs, talked about our job aspirations and even had some visitors! Mr Blakelock came to see us to talk about his role as a headteacher. We asked him lots of questions about how he helps us. We also found out that his favourite colour is green! The firemen Gary and Pete also paid us a visit. The children were in awe of the men in their uniforms. We learnt about keeping safe, and what to do if our clothes set alight. Stop, Drop, Roll! The firemen showed us their firefighting gear, and we loved trying it on! They have promised us they will return in the summer with their fire engine if we do amazing learning all year! On Thursday we learnt from Jennifer the Midwife. She came all the way from her London hospital to chat to us about her job to look after the Mums and their babies. We learnt how to wrap babies, how to listen to their hearts, how to hold them. We now also know to test the bath water with our elbows. We still have lots of visitors to come - a man from the Lifeboats, a beekeeper and a Vet Nurse! In maths we have been practising and understanding our numbers to 10, we have looked at positional language and this week we are learning our 2d shapes. Please practise your numbers to 10 at home, and practise the phase 2 sounds we have learnt so far. You could even use the Jolly Phonics songs on Youtube. This week we have begun learning phase 2 phonics. Each day the children will be introduced to a new phoneme and will learn the letter name and the phoneme sound. We will be encouraging the children to form the letters correctly and ‘sound out’ themselves when writing. We are teaching children how to 'blend' sounds together to read high frequency words. Please read with your child every day and talk to them about what they are reading. Ask them questions about the story, characters and plot. Can they predict what will happen next? We want your child to win as many certificates and prizes as possible. It is through sharing books and reading that your child will become a confident, brave and enthusiastic reader..
Talk to the children about rhyming words and patterns? Can they think of any other words that rhyme? Play games such as I spy, or practise their alliteration by thinking of words that start with the same sound. Many children are very proud that they can now write their name. Well done! Please continue to encourage your child to practice writing their name at home. You can use the name card with a whiteboard pen (these were sent out on the taster afternoons before the summer). This week the children have enjoyed sharing their previous experiences of Halloween and family traditions/celebrations. They have had opportunities to create various Halloween art including witches, pumpkins and bats! We have been printing with apples to make pumpkins and creating witch hats! We have also begun learning about Bonfire night and have shared the story of 'The Gunpowder Plot'. We are very proud of how well our children have settled in this term. Our planning this term has focused on a wide variety of activities and learning opportunities to find where the interests lie. We have looked at Autumn, shared Autumn treasures and enjoyed finding out about harvest. The children have loved learning some seasonal songs such as ‘Paintbox’ (Cauliflowers Fluffy). This term there has been a huge focus on phase 1 phonics. This is a very important topic as it focuses on the skills the children need in order to hear and identify sounds before they learn their phonemes. When you are out and about its great to encourage your child to listen carefully, what can they hear in the distance? Can they hear the rustling of Autumn leaves, or animal noises in the field? We have been sharing our Autumn treasures this week, and using the conkers to count and compare weight. Please encourage your child to practice writing their name at home. You can use the name card with a whiteboard pen (these were sent out on the taster afternoons before the summer). We have loved exploring Autumn, the children have been creating Autumn tree paintings, and exploring different ways of printing with paint. Next week we will be learning all about hedgehogs and hibernation. If you have any hedgehog themed stories, please bring them in we would love to share them. As of Monday 8th September we will be asking all Reception children to be dropped off with the rest of the school at the side entrance of the hall in the morning. The children have been so brilliant at saying goodbye to their families at the door without them having to come in, that we think they are ready to arrive with the rest of the school. Well done Minnows and Sardines! Rye Community Primary School would like to welcome the Reception class of 2018-2019! Our new children began their school journey on Monday 10th September. We spent the first few weeks settling in, learning our new routines and exploring all of the exciting spaces around the school. So far we have been to assembly, played with the older children on the big playground and tried the delicious school lunches. We have been switching on our eyes and ears by playing lots of listening and attention games to get ourselves ready for all the amazing learning that we do in Reception. The children have made quite a journey already and we are so proud with how they have come on even in their first month. This term we hope to continue to practise our listening before we start to learn our sounds! We will be going on a listening walk around the school, and we hope to go out into our community to explore every day sounds and to look for signs of autumn! Reminder: Transition afternoons next week are Wednesday and Thursday. Please bring in your white t-shirt by the 6th July to create a keep-sake. This week Minnows and Sardines enjoyed many trips to our new sensory garden. We enjoyed the new scents and sounds. We listened for the birds and we saw lots of Mummy birds feeding their babies. The children enjoyed the relaxing shade in this very hot weather. (Please do remember to send your children in with a sunhat, a water bottle and apply sun cream before they come to school too). This week we continued our Under the Sea topic. We read Hooray for Fish and then we innovated it with our own fish. We also followed our interests and built junk model boats; we tested them in the paddling pool! Which ones sunk and why? Next week we will be reading The Singing Mermaid by Julia Donaldson to carry on with our sea adventures. Where will our learning take us next? Please keep adding to your Learning Journeys on Eexat. We love to look at your home experiences as a class! Any problems with logging in please speak to a member of the Reception Team. The past couple of weeks we have been learning all about Under the Sea. 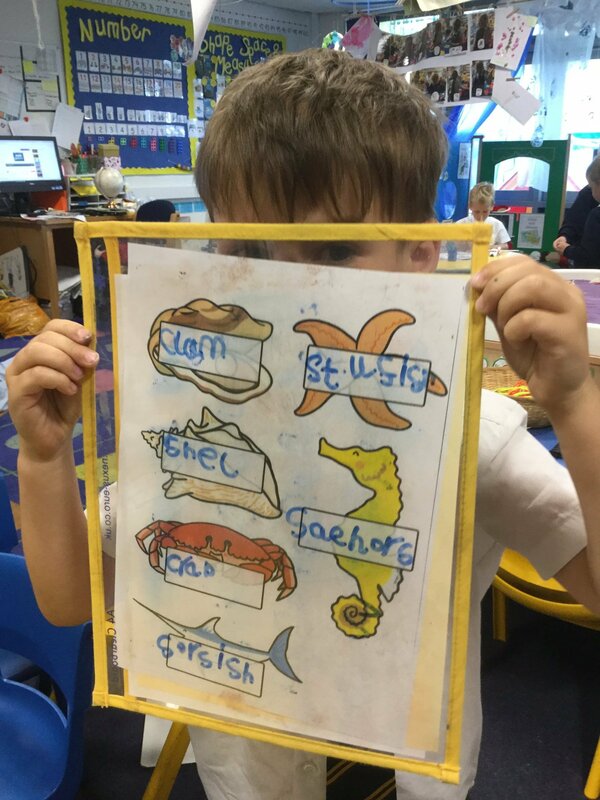 We have explored lots of fishy facts, the children have written facts and made ‘Who am I?’ posters. We have loved watching Blue Planet II clips! Today we celebrated Save the Children Den Day. Thank you for your support and contributions to a very worthy cause. We raised £65. Next week we are going to explore the imaginary world of the ocean; we will read Hooray for Fish by Lucy Cousins. The children will be revising number facts. Please continue to use maths in everyday situations with your children to make it meaningful and on-going. For example, making cakes; measuring and weighing the ingredients, sharing the cakes. Or going to the shop and letting your child count the coins. We are already preparing for sports day in our P.E sessions on a Tuesday. Please make sure your child has a fully named kit. Sports day will be on the 11th July in the morning. We are also spending lots of time with the current Year 1’s, visiting their classrooms on a Thursday afternoon. Thank you for filling in the form enclosed with the transition toys; this helps us address any worries and concerns. We thought all about sun safety this week. The children came up with lots of ideas about wearing sun cream, putting on sunhats, keeping in the shade and drinking lots of water. 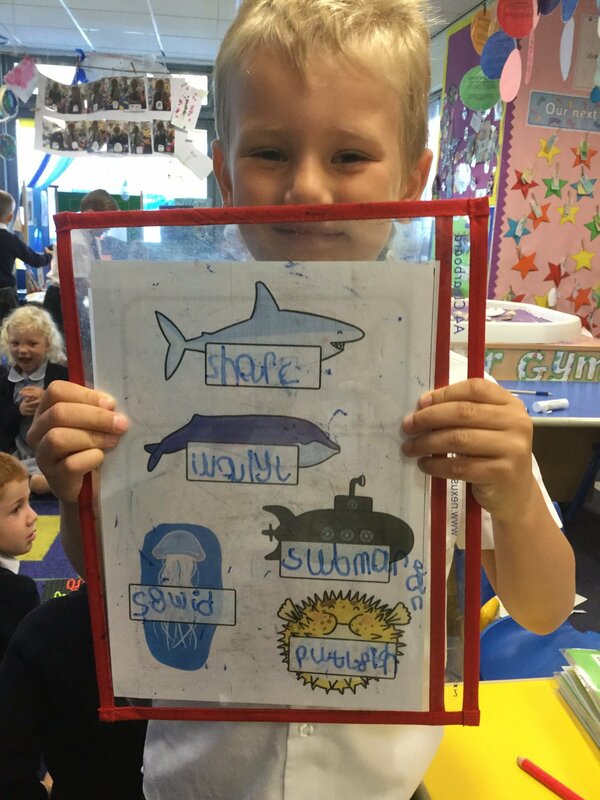 The children designed posters with a slogan. Please remember to put sun cream on your children before they come to school, and make sure they are equipped with a sun hat and a bottle of water as the weather gets hotter. Over the holidays our class butterflies were sent home with some of the children. They were taken very good care of and were released as soon as they had hatched from their chrysalis. The children loved learning about and looking after the caterpillars. Welcome back Minnows and Sardines! We have a very busy term ahead of us. We will be getting year 1 ready. It is the big push this term, so keep up that amazing reading, writing and counting at home. Can you name all of your 3D shapes? This week we are learning about capacity in maths. Maybe you could make a juice cocktail at home, or a magical potion! We are learning about keeping safe in the sun, and designing summer posters. If anyone has any toys or spare uniform they would like to donate to Minnows and Sardines we would be very grateful. Well done on all your hard work in term 5! We are very proud to be your teachers. Next term will be all about getting you year 1 ready! We will be really practising your independant writing, reading and maths. In your bookbags are lots of things for you to practise over the holidays, and there will be rewards for your efforts. Minnows will have the first session for P.E in term 6 and will be getting changed, and Sardines will have the 2nd session. Please ensure all uniform and P.E kit is named clearly. Thank you for all your efforts, and here's to term 6! 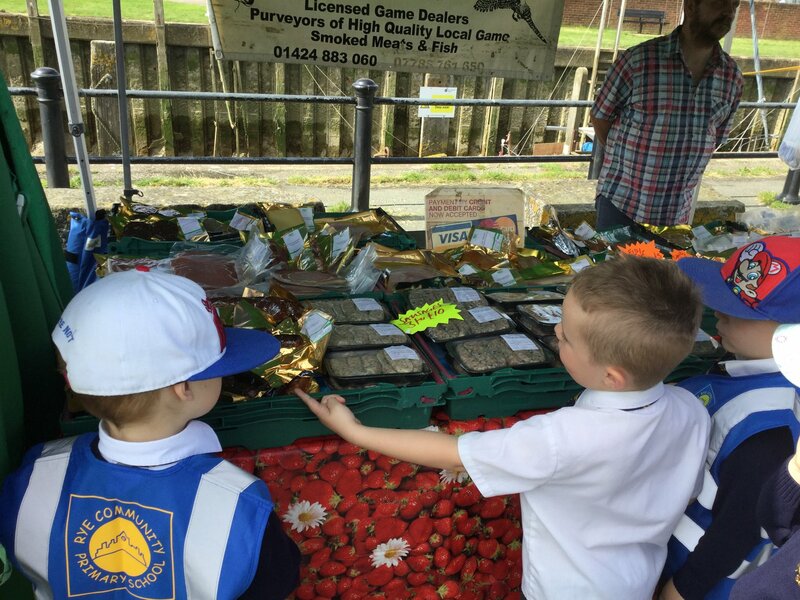 Minnows and Sardines enjoyed their visit to the Farmer's Market. Each group were given £1 to spend and shared their goodies back at school, including bread and marmalade. Leo's lovely Mummy kindly took the eggs home and made cakes with Leo for the children. 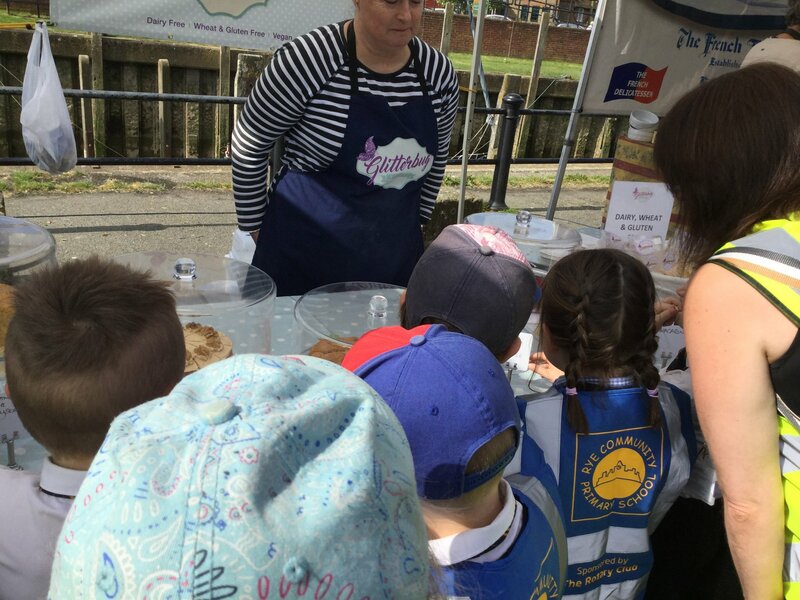 Customers at the market commented how well behaved and polite the children were. What a credit they are to Rye Primary. 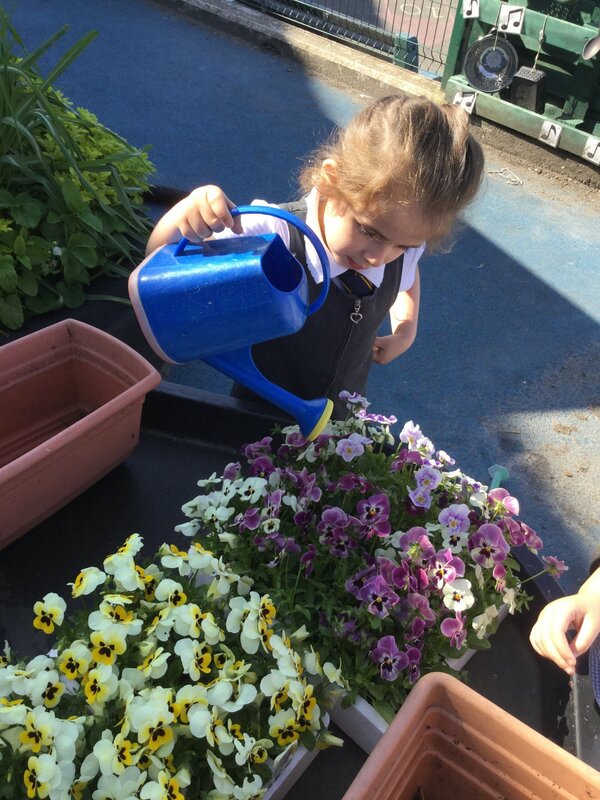 We enjoyed planting some flowers this week in our donated plant trays, they do make our outside area look colourful! Next week we will be observing our new caterpillar friends, talking about their life cycles and looking at change. In maths we will be practising our Days of the Week to go with the Hungry Caterpillar story. Happy bank holiday weekend everyone! 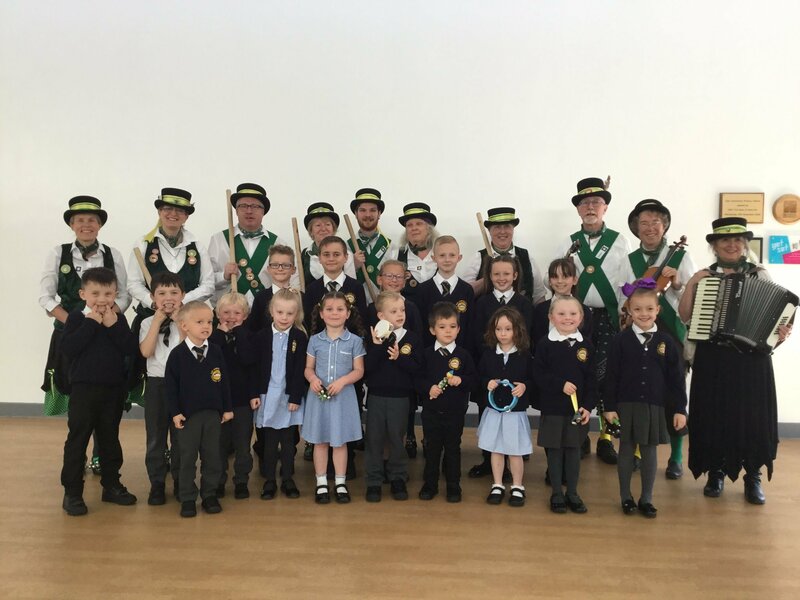 We have had a super busy week, it started off with a very exciting visit from the Romney Marsh morris dancers. 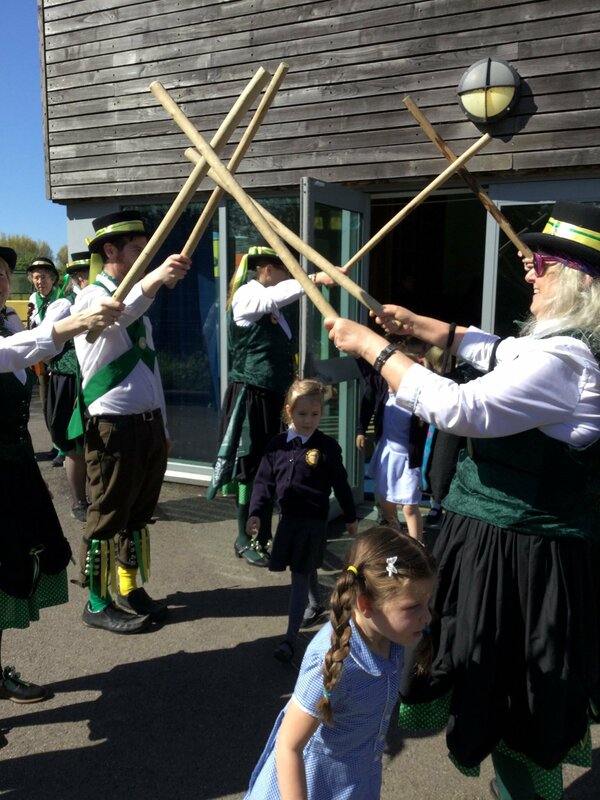 They spoke to us about celebrating May Day, showed us various kinds of Morris dancing and even taught us some moves. We loved it as some of us had never experienced it before! This week we have been learning about sharing. We did some sharing with playdough and had teddy bear picnics using cubes (or whatever we could find in the classroom really!) We ended the week with data handling, and we made tally charts for our favourite book so far this term, and then made that into a bar graph as a class. We also practised some of our number formations using our number rhymes. We ended our busy week with the Reading Café. We were so pleased that to many grown-ups came along, armed with stories and picnic blankets. Thank you, we had a lovely time. Next week we are off on a little walk to the farmer's market on Wednesday morning. We will be continuing our Data Handling maths - you could have a go on the Purple Mash website at home! (Your Log Ins were sent home - please ask if you need another). We will be doing some non-fiction reading and writing about farms. 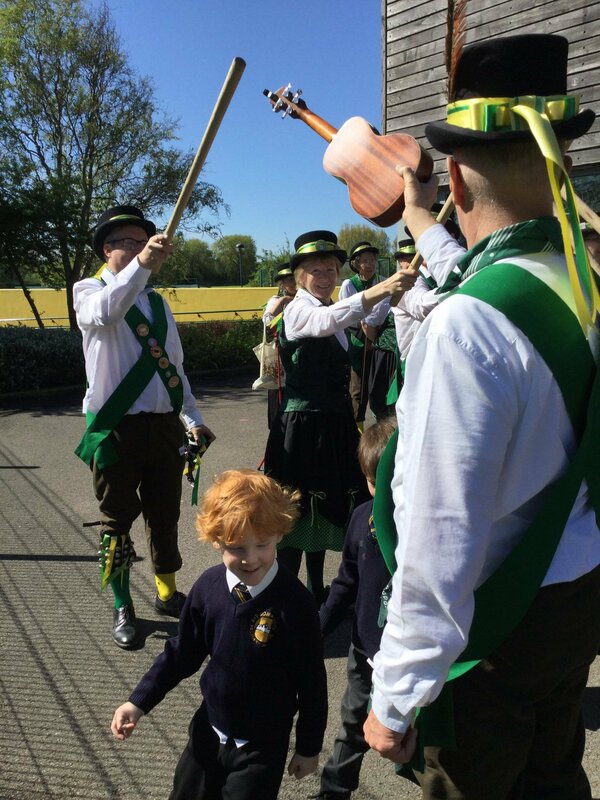 It’s the second week after the Easter holidays and we are back into the swing of things! We have been continuing our farm learning with… What the Ladybird Heard Next! We have been writing captions for various scenes from the book. Can you write a caption at home to go with a picture from your favourite story? Don’t forget to have a go at spelling those tricky words! Next week we will read What the Ladybird Heard on Holiday. In maths we have moved on from doubling and this week we practised halving. We halved fruits, objects and even pizza toppings! Next week we will be looking at sharing amounts. Maybe you could practise sharing equally at home with food or toys. Sardines are changing for P.E this term and Minnows will be staying in uniform as our timetable has switched again. 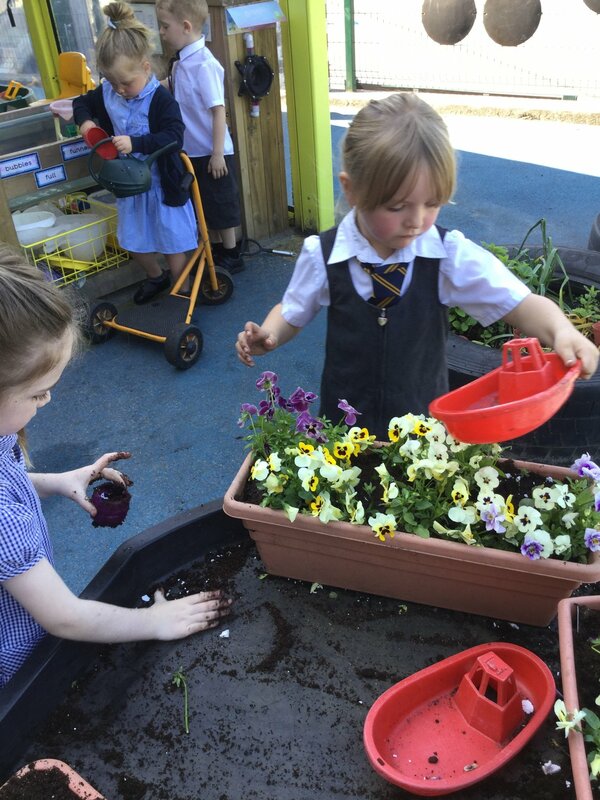 We have also been getting a bit green fingered in Reception, planting beans to stick on the window! 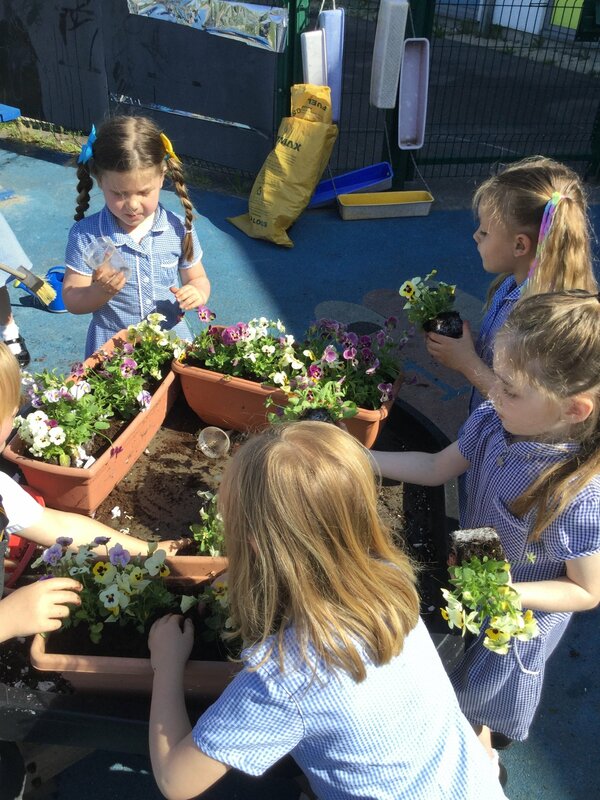 Next week we are hoping that the weather will warm up again so we can plant some sunflowers from the seeds from Mrs Mewburn’s garden. Just to remind you that our reading café will be on Friday 4th May, and our sharing assembly will be on Friday 18th May. The weather has returned back to April showers, and is a bit chilly at times. Please make sure your child comes in with at least a jumper on. Have a lovely weekend, and thank you for your plant pots and seed donations. Thank you for all the baby photos we have received so far, we are making a ‘guess who?’ display which the children are enjoying. We also have set up a baby clinic too. Our next reading café takes place on Friday 4th May; we will have a writing focus to begin with. Then we would like to have a picnic theme so children can bring a teddy that day. We do not have enough blankets so please can you bring a blanket with you so we can create a picnic atmosphere. If your child has a favourite book at home it would be great to bring that too. In maths we have been learning to double. The children know if you add the same number together it means doubling a number. They have been doubling spots on ladybirds. We hope you have been trying the home learning which was sent home. Next week we will focus on halving and will send another learning activity sheet home. The children have been writing their own speech bubbles with their own cunning plans. We definitely have some Julia Donaldson’s in the making. The weather is getting warmer! Minnows and Sardines have had a busy first week of Spring. Our trip to the Heritage Museum allowed us to see the amazing Rye Town Model, hear some stories and have a go with the Penny Machines. We had a sunny walk into the town, and we saw lots of signs of spring such as daffodils, blossom and lots of ducks! Thank you so much to the adults who came to help us. This week we finished off our Dinosaur topic, Dino-Dan has had a great time visiting some of your houses! We also had a pre-historic creature come and visit us – meet 110 year old Fred (who is actually a girl). Next week we will continue to explore Spring and Easter! We will be reading the Easter story and doing lots of lovely spring crafts. If you have any spring stories to bring in, we would love to read them. Please keep practising those phase 3 sounds and tricky words, we really want to start using them in our writing! If you see any signs of spring when you are out and about, don’t forget to ask your grown –up to take a photo of you for your learning journey. (Please tell your teachers if you have lost the log in). The clocks go forward on Sunday, so make sure you have a lie-in so you don’t miss out on any sleep. We need alert and ready-to-learn Minnows and Sardines. Our learning on Dinosaurs has been a massive hit this term. The children have discovered lots of facts about different dinosaurs and they have learnt the meaning of new words such as ‘extinct’, ‘herbivores’ and ‘carnivores’. We even had ‘dinosaur eggs’ which the children investigated with magnifying glasses to spot any ‘movement’. Thank you for supporting the home/school Dino Dan with his diary. The children will continue to bring Dan home until everyone has had a turn. Some of the diary entries have been incredible. When Archie met Dino Dan he even met his Nanny’s tortoise and shared his tea. The children have loved sharing their talk for writing innovated story ‘We’re Going on a Dino-Hunt’ by changing ‘We’re Going on a Bear Hunt’ they enjoyed becoming authors and changing the familiar story into their own. They have also stepped into time machines to go on a ‘Dino-Tour’ I’m sure they have been singing this at home. The children recreated Dinosaur’s skeletons by piecing them altogether again. Riley brought in his excavated dinosaur skeleton. They used shapes to copy or create their own dinosaurs. This week we are moving onto The Stone Age-moving a little forward in time-we will introduce this with ‘Cave Baby’ by Julia Donaldson. The children will have a go at cave drawings/paintings. Wow what a busy couple of weeks it has been! We had so much fun in the snow, it was the first time some of us had properly seen it. We went sledging and made snowmen. When we came back to school we used lots of lovely language to describe our snowy experiences. This week we have been learning about Dinosaurs. The children have been really engaged, playing with the dinosaur toys and creating their own lands from a forgotten time. Dino-Dan has started to visit our homes, he has had a great time so far and has even enjoyed a fish finger sandwich. The children came to school dressed as their favourite characters! We had a parade to show off our wonderful outfits. We enjoyed lots of book related activities and heard so many stories throughout the day. Even our teachers dressed up! We also had a Healthy Eating workshop yesterday. Two lovely ladies came in and spoke to us about eating healthily to build up our strength. We travelled around the world gathering fruit and vegetables and healthy food for our plates. We even travelled as far as China to get the rice! Please keep practising phase 3 sounds and tricky words as we will continue to go over these until we really know them. 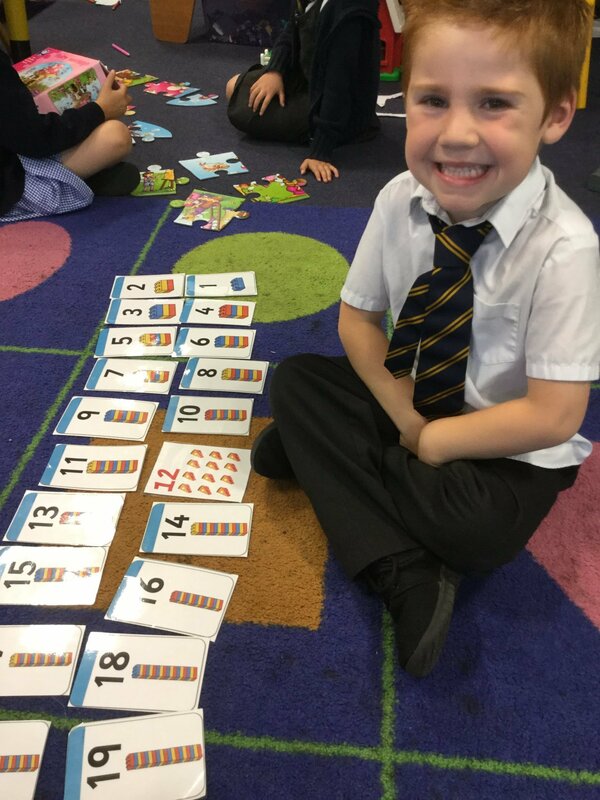 Please also practise recognising and writing numbers to 20 and beyond, working out one more and one less and combing groups of objects together. Can you write a number sentence? We are always excited to see any learning you do at home, so please bring it in or ask a member of your family to upload a photo and comment to your Eexat online learning journey. Dinosaurs will continue next week, if you have any related stories we would love to read them to the class. P.S Mrs Baker and Miss Dicker are organising a trip to the Rye Town Model on the 20th March, letter to follow! Let us know if anyone would like to volunteer to help. Thank you! Happy Snow Day Minnows and Sardines! Who is up for a home learning challenge?